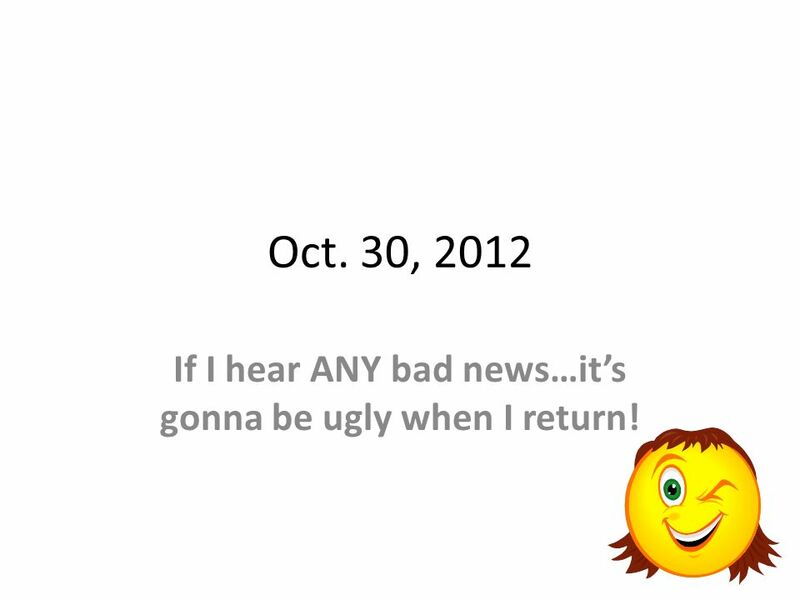 Oct. 30, 2012 If I hear ANY bad news…its gonna be ugly when I return! 1 Oct. 30, 2012 If I hear ANY bad news…its gonna be ugly when I return! 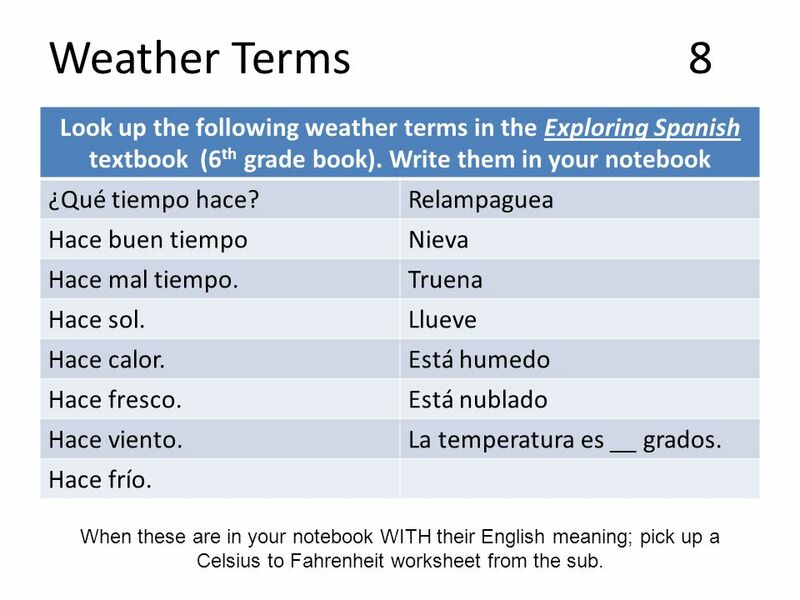 2 Weather Terms8 Look up the following weather terms in the Exploring Spanish textbook (6 th grade book). Write them in your notebook ¿Qué tiempo hace?Relampaguea Hace buen tiempoNieva Hace mal tiempo.Truena Hace sol.Llueve Hace calor.Está humedo Hace fresco.Está nublado Hace viento.La temperatura es __ grados. Hace frío. When these are in your notebook WITH their English meaning; pick up a Celsius to Fahrenheit worksheet from the sub. 6 Presentational Speaking8 Work with your son las tres to write a short play about yourselves. 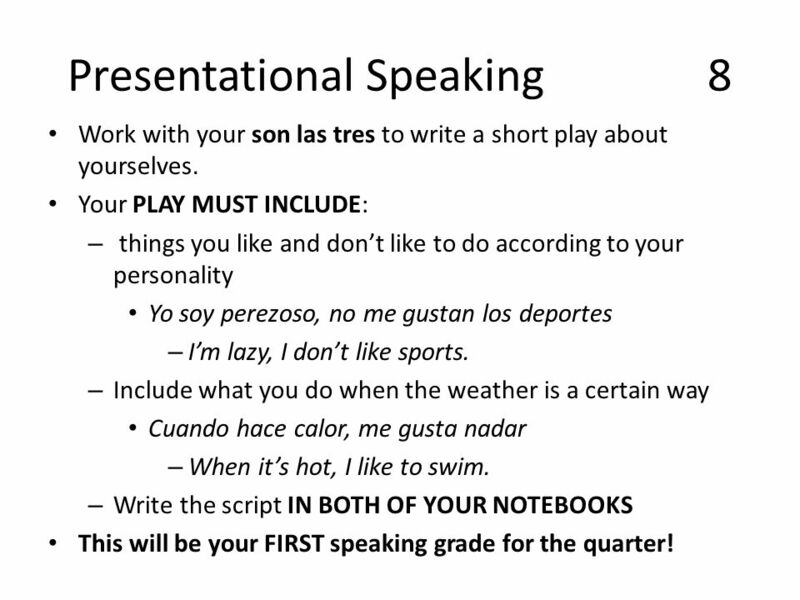 Your PLAY MUST INCLUDE: – things you like and dont like to do according to your personality Yo soy perezoso, no me gustan los deportes – Im lazy, I dont like sports. – Include what you do when the weather is a certain way Cuando hace calor, me gusta nadar – When its hot, I like to swim. 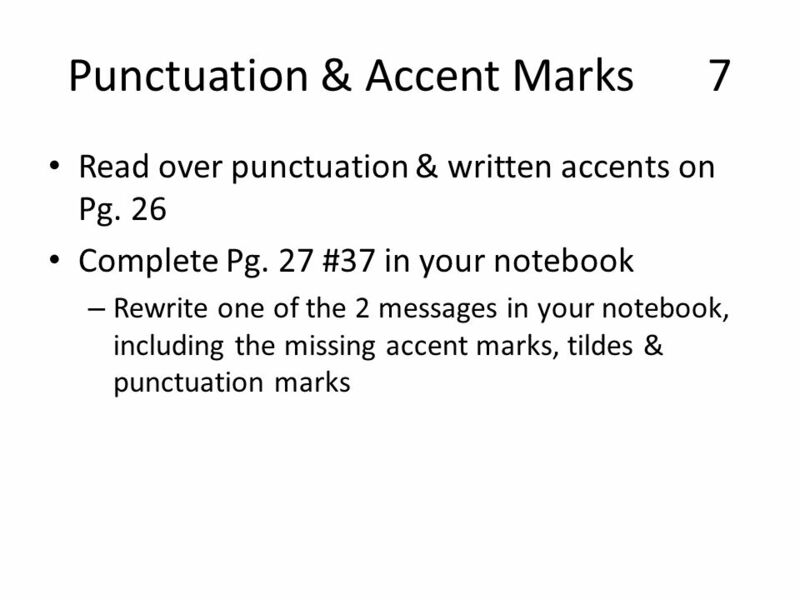 – Write the script IN BOTH OF YOUR NOTEBOOKS This will be your FIRST speaking grade for the quarter! 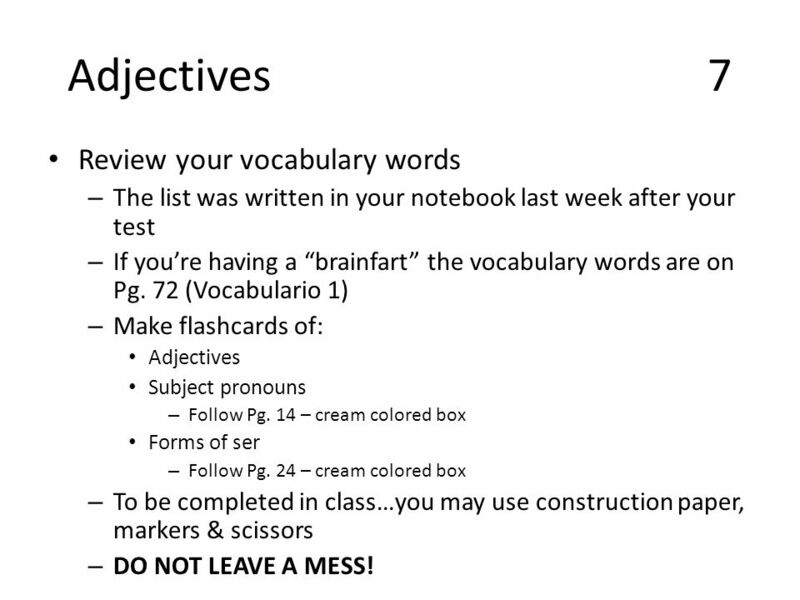 7 Adjectives7 Review your vocabulary words – The list was written in your notebook last week after your test – If youre having a brainfart the vocabulary words are on Pg. 72 (Vocabulario 1) – Make flashcards of: Adjectives Subject pronouns – Follow Pg. 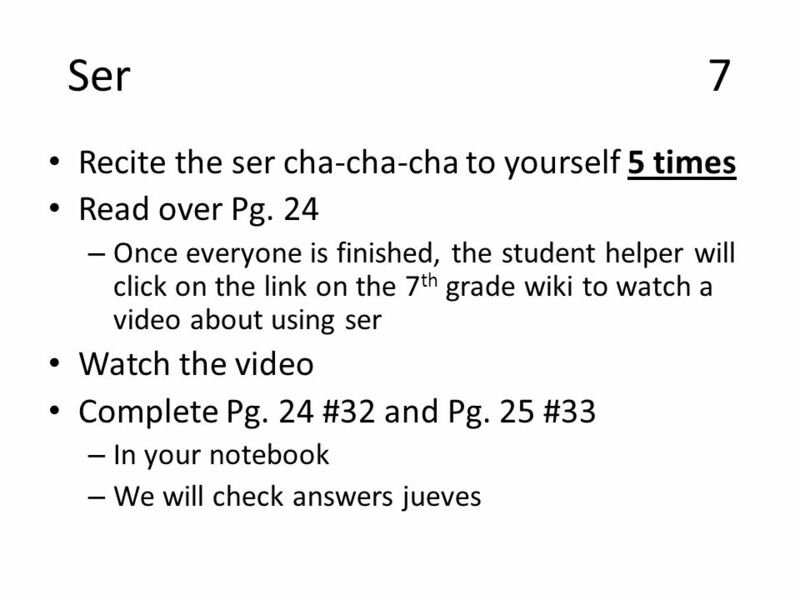 14 – cream colored box Forms of ser – Follow Pg. 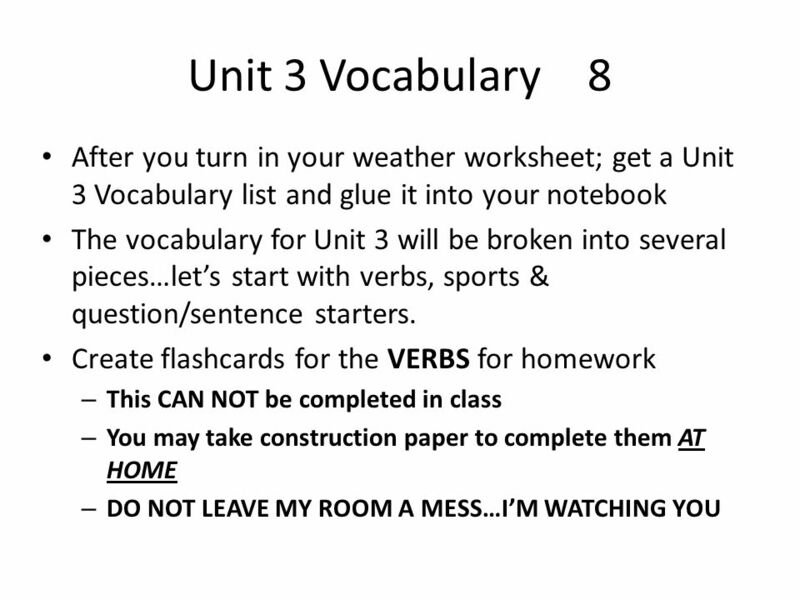 24 – cream colored box – To be completed in class…you may use construction paper, markers & scissors – DO NOT LEAVE A MESS! Download ppt "Oct. 30, 2012 If I hear ANY bad news…its gonna be ugly when I return!" You need to improve the way you write and think in Spanish! The Weather This is an interactive presentation. You need your work sheet, your pencil, and. Capítulo 1 The Verb: Ser. Gustar Verbo Gustar Verbo Gustar Verbo gustar. Gustar Expressing likes and dislikes. Gustar Gustar = to be pleasing (to like something) You add pronouns to tell who it is pleasing to. Me = to meNos. Nov. 29, 2012 If I hear ANY bad news…its gonna be ugly when I return! 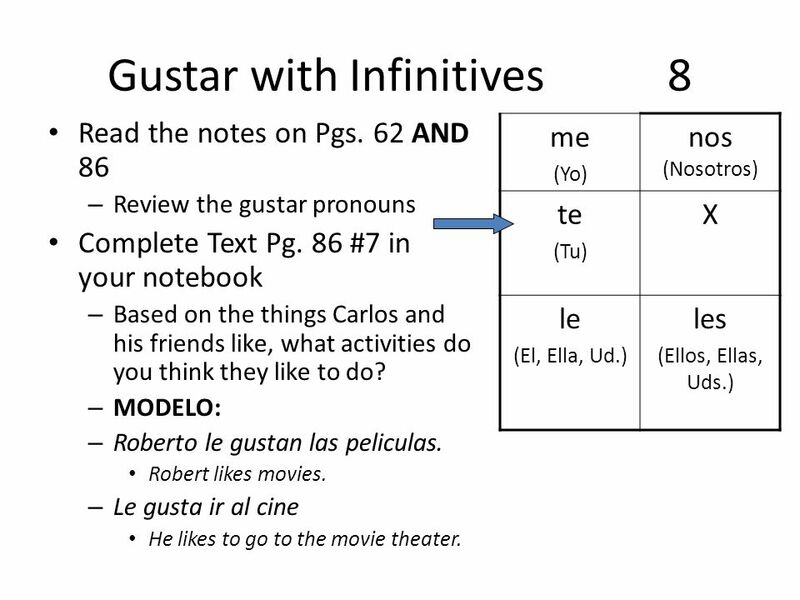 The verb gustar me gusta(n)nos gusta(n) te gusta(n)os gusta(n) le gusta(n)les gusta(n) gusta is used if item is singular gustan is used if the item is. 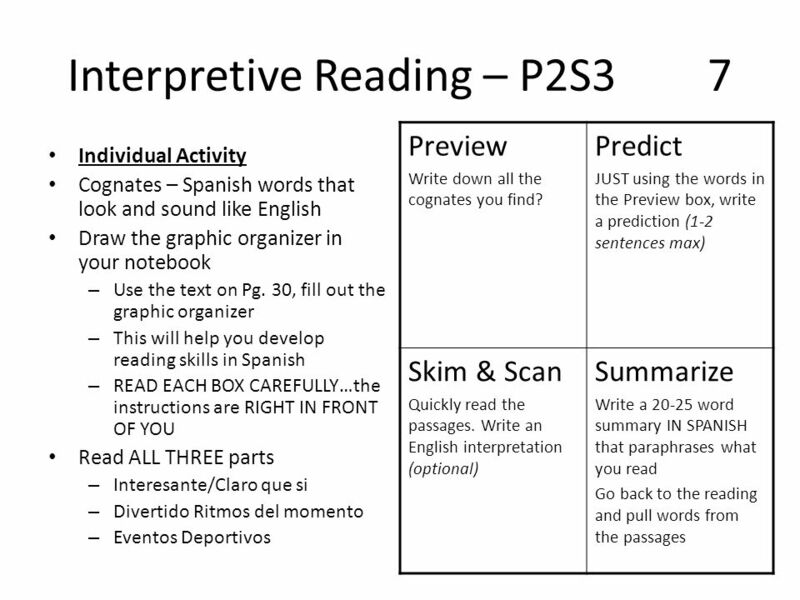 Actividad Inicial #1 Copy the information at the right to p. 15 in your notebook. While you are copying, I will be coming around to stamp countries/capitals. Warm-Up 1. Write 2 sentences talking about 2. whats going 3. on in this 4. picture: (In SPANISH) ¿Qué pasa aquí? T HE VERB GUSTAR, ¿ POR QUÉ ? AND PORQUE. T HE VERB GUSTAR Use the verb gustar to say what people like. Use the form gusta if the thing they like is singular. 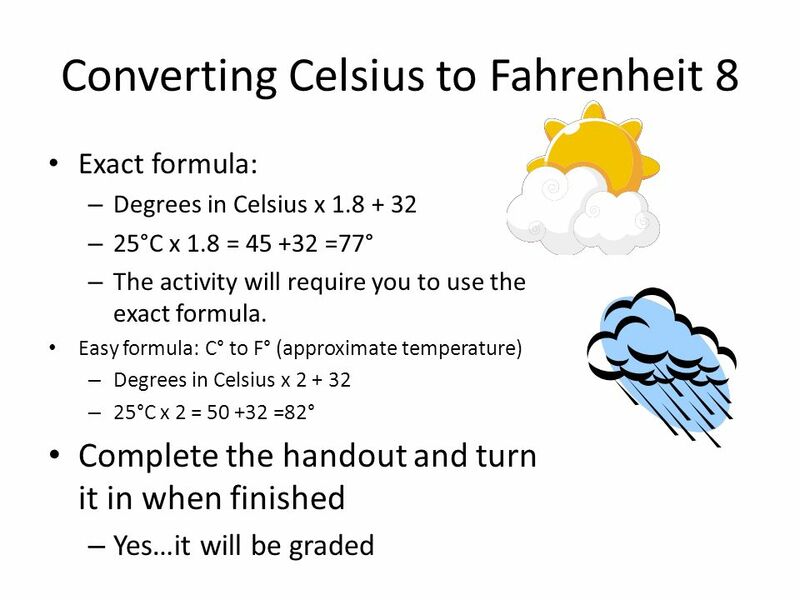 El tiempo Hecho por Dr. Jacobs © El tiempo This PowerPoint gives you the common words we use in class to describe the weather, or el tiempo. Practice. İMe gusta el verbo gustar!. 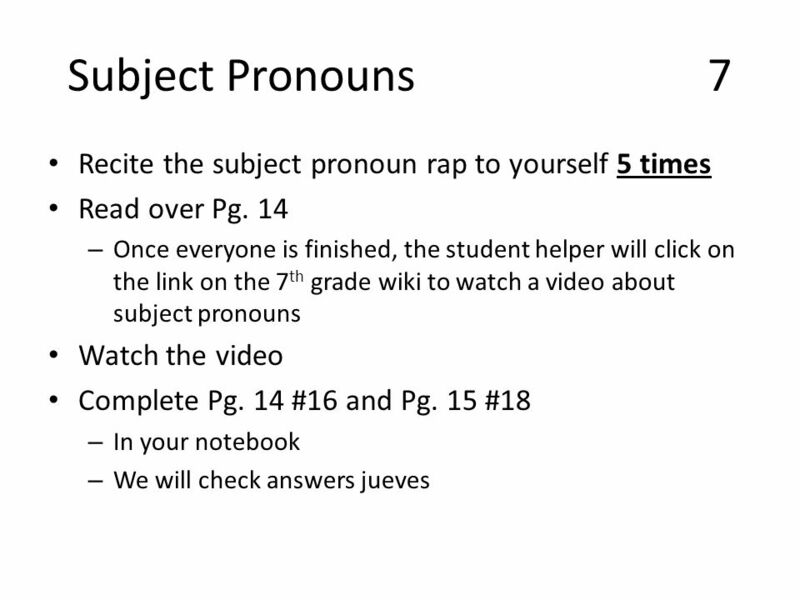 1) You use: A mí, A ti, A ella, A Ud., A Juan, A nosotros, A ellos, A Uds. A Juan y Carmen (these emphasize who you are talking. Repaso de gramática Capítulos uno y dos. Essential ?s: How do I say ‘it’ and ‘them’ in Spanish, and how do I refer to people who get things?